Probyn Export delivers a large variety of millwork wood products to a global clientele. 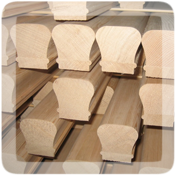 From mouldings to doors and door parts, to interior paneling and exterior siding, all of our milled and machined goods come from quality logs taken from Canada and the United States. As well, the raw logs that we manufacture our millwork from are harvested from environmentally friendly logging practices. When you do business with Probyn Export you're dealing with an established company that has a long history and outstanding reputation as a reliable business partner. We're also a member of The Probyn Group, an internationally known forestry products business that does over $250 million dollars of sales a year. Contact Probyn Export with any questions concerning our millwork products, or how we can help you find the best product for your needs.